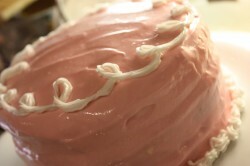 Published on February 21, 2011 in Recipes. 3 Comments Tags: buttersponge cake, chiffon cake, cream cheese frosting, genoise cake, Passion Fruit Chiffon Cake, Passion Fruit Filling. Chiffon, genoise or buttersponge cakes were hugely popular only a few decades ago, and while this may not be a leading edge recipe on the cake baking trend curve today, this retro recipe is a keeper. “What is a chiffon cake?” you ask. Chiffon cakes are foam cakes, that are leavened primarily with beaten egg whites, similar to angel food cakes. While chiffon cakes may look delicate, once the basic cake is in place, you can infuse it with all kinds of different flavors. 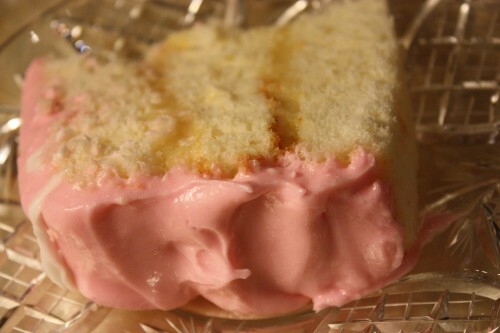 Unlike angel food cakes, chiffon cakes, contain both egg yolks and vegetable oil. These two ingredients keep the cake moist, soft and tender and result in a cake that tastes great, is highly versatile, sturdy and keeps well. They are typically baked in tube pans, just like angel food cakes, but can also be baked into sheet cakes and cupcakes. 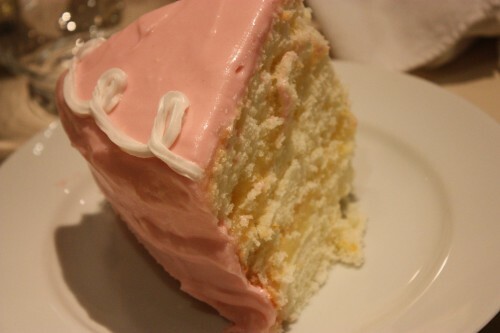 Legend has it that the chiffon cake was invented in Los Angeles in the late 1920s by a baker/caterer named Harry Baker. The light and airy, yet moist, cake was coveted. Despite its popularity, Baker kept the recipe a secret for 20 years before finally selling the recipe to General Mills, which introduced it to the American public (via Betty Crocker) in 1948. While this recipe isn’t one that you can quickly toss together, it is well worth the extra steps. Note that there are three recipes below to compile this master piece, and corresponding directions to follow. I recommend that the filling, frosting and cake are compiled in that order to allow for proper set-up time of each recipe. In a medium size saucepan, whisk together the sugar and cornstarch. Next mix in the passion fruit nectar, egg yolks and vanilla seeds and cook over moderate heat, stirring constantly, after approximately 6 minutes the mixture should reache a thick consistency. Remove from the heat; whisk in the butter, 1 tablespoon at a time, until incorporated. Scrape the filling into a glass bowl, press a sheet of plastic wrap on the surface and refrigerate until chilled, about 2-3 hours. Cream the butter and cream cheese together, for approx 3 minutes. Add the vanilla extract and mix well. Add the powdered sugar, continually tasting to get to desired sweetness. If using food coloring, add a few drops until reaching the desired color. 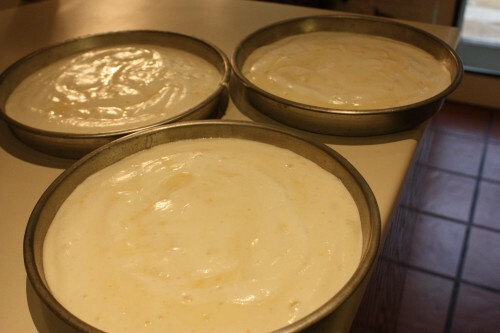 Coat bottoms of 3 (8-inch) round cake pans with cooking spray (do not coat sides of pans); line bottoms with wax paper. Coat wax paper with cooking spray and dust with 1 TBS of flour. In a large size bowl, lightly spoon 2 cups cake flour into dry measuring cups. Combine 2 cups cake flour, 1 cup sugar, baking powder, and 1/2 teaspoon salt, stirring with a whisk until well mixed. 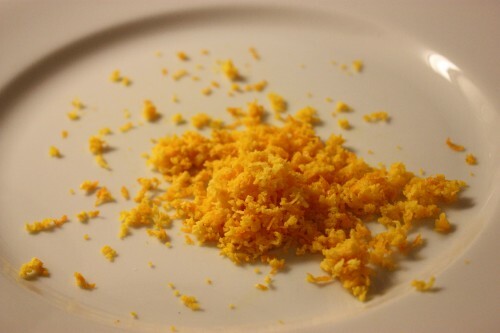 In a medium size bowl, add oil, orange juice, passion fruit juice, water, coconut extract, orange rind, coconut extract, and egg yolks, stirring with a whisk. Add oil mixture to flour mixture; beat with a mixer at medium speed until smooth. Note: this step is the most critical to a successful chiffon cake; if the eggs are not correctly whipped the layers will not properly rise. In a large bowl, add egg whites and beat with a mixer at high speed until foamy. Add cream of tartar; beat until soft peaks form. Gradually add remaining 1/4 cup sugar, 1 TBS at a time, beating until stiff peaks form. 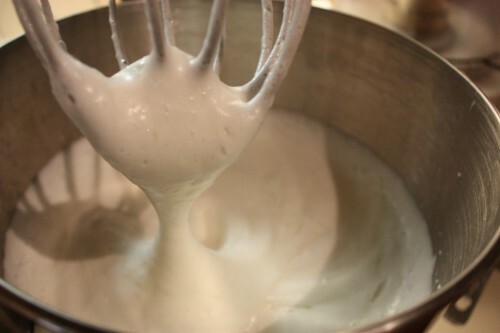 Gently stir one-fourth of egg white mixture into flour mixture; gently fold in remaining egg white mixture. Divide cake batter equally among prepared pans. Remove any air pockets by cutting through batter with a knife. Bake for 20 minutes or until cake springs back when lightly touched. Cool in pans for 10 minutes on a wire rack; remove cake from pans. Remove wax paper from cake layers. Cool cake layers completely on wire rack. To assemble cake, place 1 cake layer on a plate; spread half of filling over cake layer. 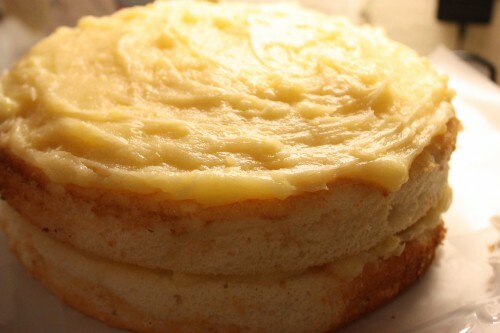 Top with second layer, remaining half of filling, and then top with the third layer of cake. Spread frosting over top and sides of cake. Garnish as desired. Store cake loosely covered in refrigerator for up to 3 days. Oh Lord, I’m in love with this cake. This looks like the perfect recipe to break in my new Kitchenaid mixer. My Rubenesque thighs thank you. I would be honored if you did. Would love to guest blog your biscuits! Wow! I love everything about this cake. Passion fruit is such a great flavor. The way you decorated it truly looks retro. I’m in love with it! All I need is a big slice.